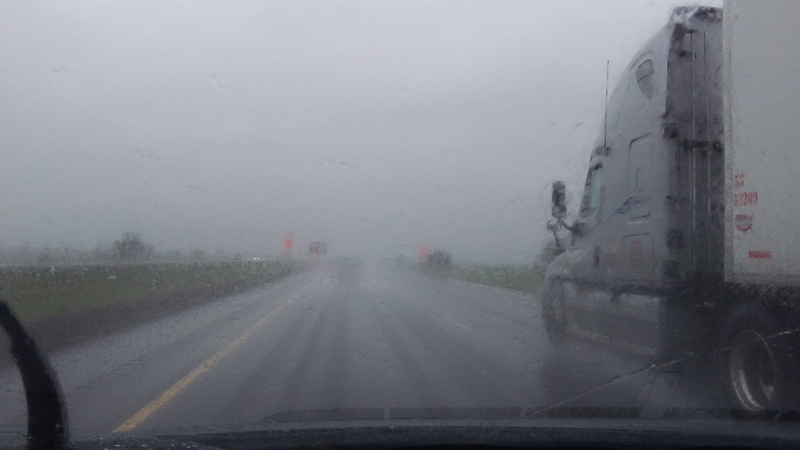 Visibility is not the best when it rains even a little on I-5. It wasn’t foggy in the valley Wednesday except on I-5. And there the gray blanket in the air wasn’t fog but the usual spray kicked up by traffic. Which made me wishing for the umpteenth time for better drainage on the freeway. The forecast calls for heavy rain in the Willamette Valley starting tonight and continuing through the weekend. So there’s a good chance that drivers on the freeway will once again be driving nearly blind, especially as traffic picks up ahead of Christmas. I used to blame the big semis whose trailer wheels are unprotected by any kind of mudguards or fenders. But actually, pickups and passenger cars also kick up plenty of spray as they race along at freeway speeds, their drivers seemingly unmindful of the possibility of hydroplaning out of control. Didn’t I read some years ago about the growing use of semi-porous asphalt surfaces on highways so that standing water would be absorbed more quickly? If that’s been done on any of the Oregon freeway resurfacing projects lately, it may have improved the situation but has not solved the problem. And of course some stretches of I-5 have been resurfaced with what looks like concrete, where the water has no place to go except to slowly drain to the side. There’s not much you can do about the amount of water we must drive through but there is a product out there (for many years) that does wonders for wet weather visibility, day or night. When passing trucks on I-5 it really helps a LOT. It’s called RAIN-X. Follow the easy instructions! With Rain-X, water will bead on any treated glass surface and literally blow off your windshield. Your wipers will work better. At night, usually you don’t even need your wipers. This stuff works that well. I’ve been using it since the late ’70’s. A bottle lasts a long time. I’m NEVER without RAIN-X in my car, and on the windshield. You must re-apply it infrequently. BTW, I have no interest in this company, just in helping people see better in very wet driving conditions. It’s worth every nickel. You will not have the problem you described if you follow the directions completely, Jim. Pay attention to the part that says you must wipe the window with a dry terry towel after it has dried (takes only a few seconds to dry). Failure to do this will indeed cause the type of problem you describe. At night, I rarely even use my wipers if I’m above, say, 40mph. I do NOT experience the gold sheen you describe.